Maraya brought the striking calligraffiti of acclaimed French-Tunisian street artist eL Seed to the city of Sharjah in a compelling live outdoor street art initiative, Jedariya. 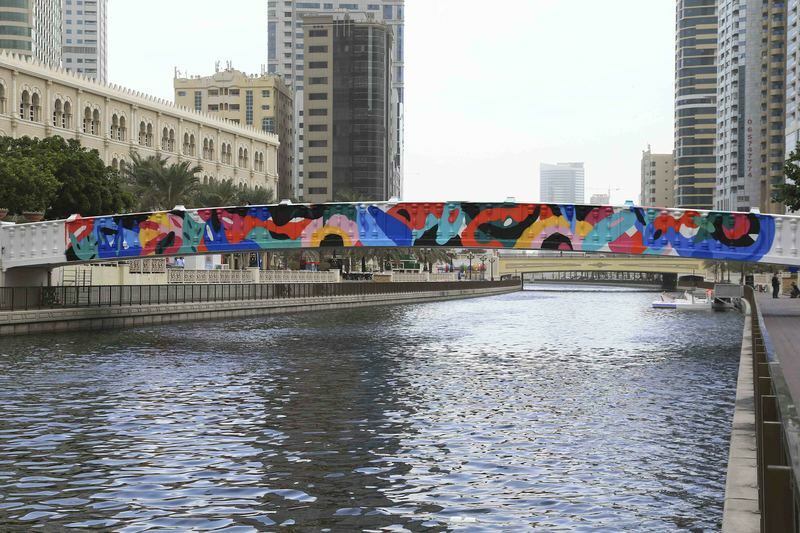 The project, which aims to beautify Sharjah's streets while involving Sharjah's diverse youth population with the arts, consists of an elaborate painted calligraphy-styled mural on the walls of the Sharjah Bank Street building by eL Seed. eL Seed is famous for his unique style of calligraphy - fusing elements of both the graffiti and Arabic calligraphic traditions - which uses complex design to call not only on the words and their meaning, but also on their movement and flow, luring the viewer into an alternate frame of mind. Maraya Art Centre intends for all projects led under this initiative to have a community incentive, which sometimes can be as simple as merely getting young people involved in the arts, while at other times may require them to actively participate in aid of raising awareness for an important cause. 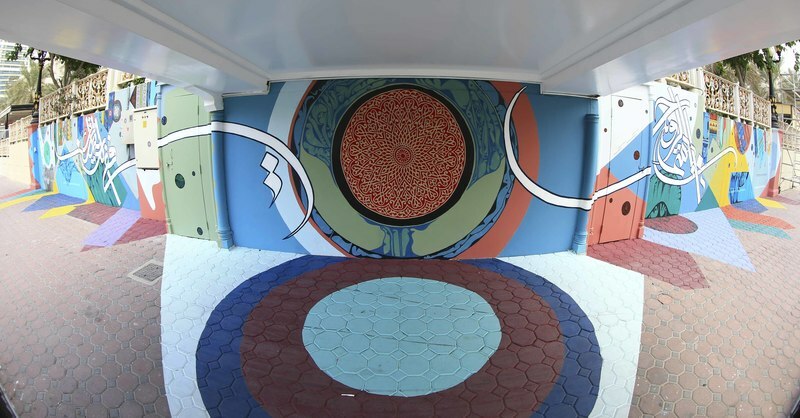 Maraya Art Centre, continues to enrich Sharjah’s cultural landscape, literally, with a life-size mural by MYNEANDYOURS. Jedariya, the live outdoor street art initiative presents a street artist to bring to life and beautify areas of the city with their signature style, bold colours and inspiration they find from Sharjah. Born and raised in London, Iraqi Marwan Shakarchi moved to Dubai a year ago to pursue a career in the arts where he came up with the image of a cloud caricature with ‘x’s for eyes. The symbol that he has been using to represent his practice and has since become synonymous with the artist himself and various marketing elements such as stickers, postcards and key chains. The final product consisted of colourful clouds rising from the ground to the sky against a grey backdrop, with lines which follow them representing motion, which in turn signify people’s motion to develop and move forward. This, he says, also reflects in all great initiatives, industries and cities, in particular art in Sharjah and the UAE. Maraya Art Centre has collaborated with Zena Adhami on the third edition of Jedariya. UAE born graphic artist Zena Adhami, drew inspiration from the Arabic phrase “Smile you are in Sharjah”, an iconic sign on Sharjah’s roundabout next to the port. “Any Sharjah resident can tell you a story or two on how that phrase has been a part of their making while living in this city. I personally wanted to give life again to that piece of history, by recreating a special font in another prime location, and with colors that evoke memories of our childhood in this city” says Zena Adhami. You can visit Jedariya located next to Noor island entrance, on the Sharjah Corniche. The main idea behind Magdy Elkafrawy's project is to introduce Islamic art in a way that is compatible with modern art. The mural is based on the use of Islamic vocabulary in its known form or through visual gestures that suggest its existence by using different raw materials, such as Arabesque, Khyamia (patchwork) and others, in a huge work that combines graffiti and mural. On the other hand, Mohamed Abdel Aziz addresses absolute beauty through his expressive language, which takes the form of graffiti art. He visually designs a verse by the poet Nizar Qabbani in an authentic Arabic calligraphy that occupies the center of his mural, thus creating an aesthetic space in which the sensitivity of the audience and their passion for beauty are caressed. By this Jedariya, Trasila attempts on creating an experience that would allow the visitors to relive childhood memories and creating new memories for the children who visit the place almost on a daily basis. The bridge at Al Qasba with its colourful patterns mixed with the architectural beige context bring together a playful perspective to the surrounding environment. “When I visited Al Qasba I felt in love with the area because it brought back memories of the amusement parks I played in when I was a child. This is why I decided to create something that could recreate that feeling of lightheartedness we all feel when we're children, even if just for a few moments. Crossing that colorful bridge is a way to relive those happy days for one last time” Tarsila Schubert. Maraya Art Centre presents Vincent Abadie Hafez, also known as Zepha, for this edition of Jedariya. Given the geographic location of this Jedariya, Vincent’s transforms the Awqaf building at the Heart of Sharjah by his exploration in graphic research relationship between tradition and modernity. The Department of Awqaf enhances the awareness of Islamic waqf (endowment) by promoting this Sunnah, urging the wealthy and investing waqf funds with the aim of promoting them and directing revenues to meet the religious legal objectives of waqf donors to be model for the service and development of the society.